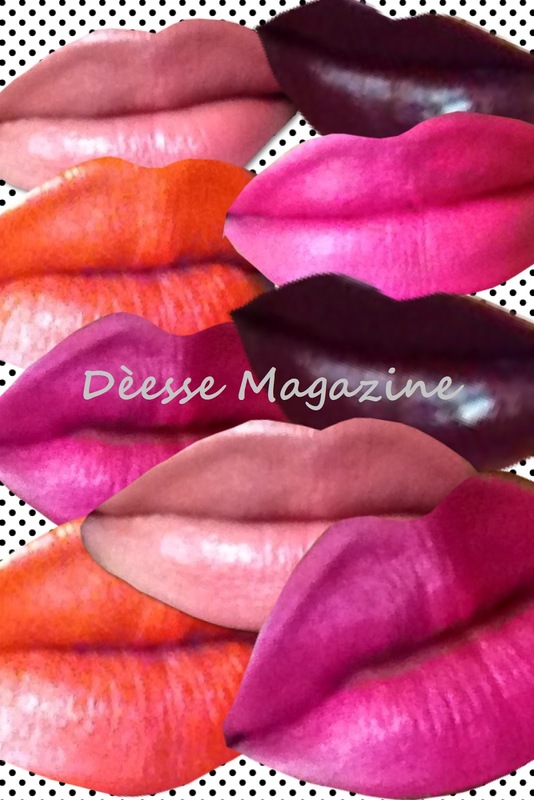 Dèesse Magazine: Lichtenstein ?!!?!? Oh no.. That's just my new lip colors for Spring ! Lichtenstein ?!!?!? Oh no.. That's just my new lip colors for Spring ! It was only after I completed this collage that I realized it was very Litchenstein-esque. Above you have a round up of some new colors for Spring that I am excited to wear and some are VERY affordable - as low as GASP 5USD !! Givenchy Le Rouge in 103 Brun Creatéur - (Dusty rose top left and center) - $36 This is most expensive in group but it is very LUXE in its packaging alone - Genuine Leather! The color is very pigmented and goes on very smooth , and its Givenchy so the price is to be expected - let's be honest! MAKE UP FOREVER Rouge Artist Intense in 40 - (Satin bright Orange top and bottom left) - $19 Make Up Forever is the go-to brand for highly pigmented colors and that is what you get with this Orange. Its very pretty and speaks for itself. Sephora Collection Rouge Cream Lipstick in Love Test 11 - (Blueish Bright Pink, second to bottom left and bottom right) - $12 This is such a pretty bright pink lipstick - It can rival the cult favorites "Candy Yum Yum" by MAC and "Schiap" by NARS - which are pretty much sold out almost everywhere. You get the same look for less and this is a Cream so no worries about the drying of your lips with a Matte. Sephora Collection Rouge Cream Lipstick in Bewitch Me 24 ( Deep Cool Grape , top and bottom right) - $5 !!!!!! This fabulous deep hue is on sale for some reason - but I'm not complaining at ALL. IT is a STEAL ... Although some love deep colors for the fall / winter - I love to shake things up and wear Dark colors whenever I want. This is a mandatory purchase !!!!!! Sephora Collection Cream Lip Stain in 06 Forever Fuchsia (Satin Electric Fuchsia , top right) - $12 Not exactly a lipstick , but it is a honorable mention. Dries with a Matte Finish ( another color that can rival the Candy Yum Yum and Schiap ), you can build on the intensity with your application . For the pink pictured above, I applied a few more coats than just two. There you have it , the latest editions to my lip color collection - which I absolutely LOVE !!!! All of the colors can be purchased at Sephora Stores ( see links above) . Lovely lip colors for spring!